Heidi Herman is a native to Illinois with a proud Scandinavian heritage and close ties to Iceland. Her mother is a native of Iceland, who met and married a US serviceman who was stationed there in WWII. Heidi grew up with stories of brave fishermen, mischievous trolls and adventurous Vikings. She once insisted to her elementary teacher that Leif Ericsson, not Christopher Columbus discovered America and that the history books were wrong. Her mother, Ieda, published her memoirs in the winter of 2012, Troll Monster Worm Hidden Folk, Fond Memories of Iceland. Inspired by her mother’s memoirs, Heidi was again immersed in childhood memories of legend, lore and imaginative stories. She created holiday yard art based on one of the folk legends recounted in her mother’s book. 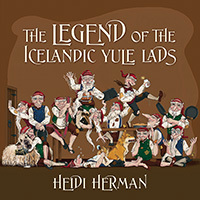 The troll-like characters sparked the imagination of many and led to Heidi writing her first book, Legend of the Icelandic Yule Lads. Heidi is now working on a series of stories chronicling new adventures of the Yule Lads as well as a collection of folk stories introducing other Icelandic mythological characters. Heidi current lives in Illinois with her two Schnoodles, Dusty and Thor. She is just down the street from her mother and they work together regularly on new stories and bringing the magic of Iceland to anyone whose ear they can bend.